My Grandmother, Eliza September with my grandfather, William Maart. They are accompanied by their three children; my uncles, John and Stanley and my mother, Mona. My grandfather, Isaac George and my grandmother, Ethel Matthews (seated on left) accompanied by their children Dorothy, Walter, Mavis, Phyllis (end right), Edith (end left) and my father, Stanley, aged 6. 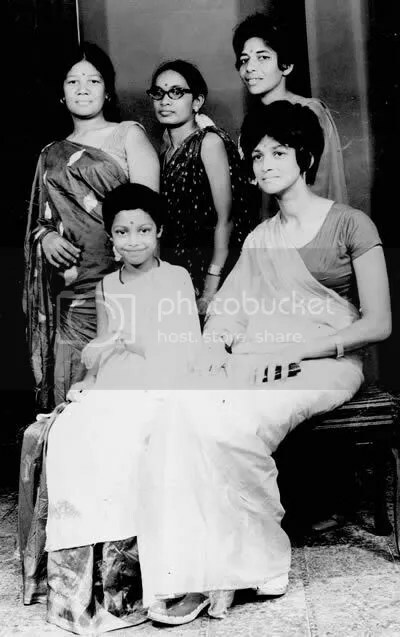 Taken in 1970 when I was 7 going on 8, in Durban, while visiting my grandmother’s family. I am sitting beside my mother. After pulling lumps of chewing gum from my hair, my mother decided it all had to come off. Standing are, from left to right: My Aunt Annabelle (my mother’s sister), my Aunt Pat (my grandmother’s cousin) and my aunt, Jenny (my father’s cousin). I was born in District Six, Cape Town, South Africa. “District Six was named the Sixth Municipal District of Cape Town in 1867. “Originally established as a mixed community of freed slaves, merchants, artisans, labourers and immigrants [brought from the British and Dutch colonies like Java and Malaysia], District Six was a vibrant centre with close links to the city and the port. By the beginning of the twentieth century, however, the history of removals and marginalisation had begun” (taken from The District Six Museum). My family was forcibly removed from District Six in 1973 as a result of the government’s Forced Removal Act, which was passed in 1950 but implemented in the early 1970s. Maart is my mother’s last name (surname), the name of her father who was born in Mossel Bay, up the Eastern coast line, whose ancestry was San and Khoi––both Indigenous Peoples of South Africa. September is the last name of my maternal grandmother whose Hindu ancestors were forcibly taken from Java by the British to St. Helena, in the Atlantic, off the west coast of Africa, then later to Cape Town in the 1800s in the area later classified as District Six. Most of my grandmother’s Hindu relatives live in Durban and Kimberley. My cousins in Mossel Bay are named Maart and April and when we met there was no stopping our laughter: a laughter we shared with irony and sarcasm. We are always reminded of our slave ancestry, since our last names reflect the naming of South African slavery under Dutch rule: each of my family lines named to note the time of our liberation, in Dutch––Maart (March), April and September. I grew up in a house which reflected all of my ancestry. My grandfather’s sister became Muslim and had more than a dozen children, all of whom came to our house, which had to be a Halal house in order for them to eat with us. They lived off Hanover street, one of hte main arteries of Distict Six. Our way of life was not uncommon in District Six since neighbours were treated as part of your family. Until I was 18 years old this was the only family I knew. My uncle Stanley was very much a father figure in my home. I first met my father the year I turned 18. Now deceased, he is from East London, up the Eastern Coast of the Cape Province. 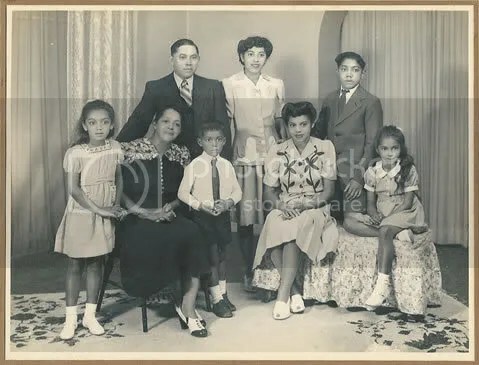 My father’s mother, Ethel, was born in St. Helena Island–her ancestry can also be traced to Mauritius, where an Indian population was already thriving when she was a girl. She too has Dutch ancestry. 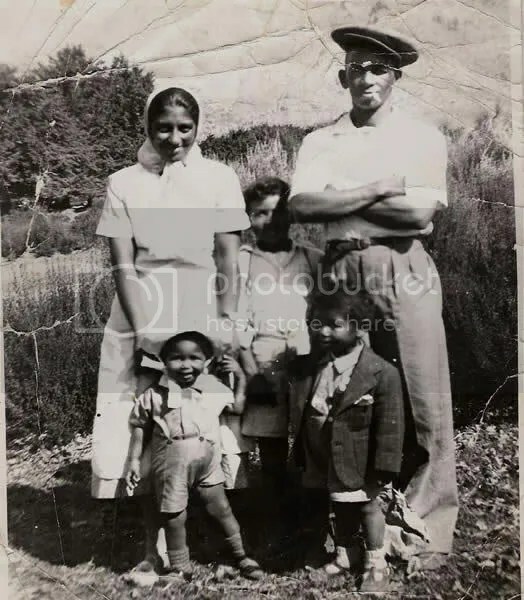 Ethel along with her siblings was transported to District Six from St. Helena and was raised in District Six and later settled in East London; her sisters and brother remained in District Six and were our neighbours, which is how my parents met. My grandfather, my father’s father was born from a Lebanese father and Dutch mother; this is apparently why we have so much hair and why people often speak to me in Arabic, and Hindi, among others! I went to George Golding Primary School, then Square Hill for one year after the District Six move, then Steenberg Senior Secondary, which were really the best years of my life. I later attended the University of the Western Cape and was a regular, for years, at the Community Arts Project in Woodstock and the Space Theatre on Long Street. Theatre has been present in my life in many different forms . . . as many of my students will attest.